Dense, luscious cheesecake with a peanut butter cookie crust and chunks of chocolaty peanut butter Oreo cookies all the way through it. Keep the Oreo chunks bigger so that they don’t get mushy. 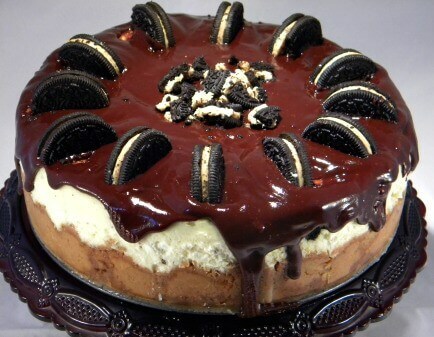 Dense and creamy cheesecake with chunks of peanut butter oreos, topped with a silky chocolate ganache. Cover the bottom and sides of a 9 inch springform pan with aluminum foil. Mix the butter and the crumbs and press into the pan. Press the crumbs about half way up the sides. Mix the cream cheese on low speed until creamy. Add sugar and continue to beat. Fold in the sour cream and vanilla. Layer the chopped oreos over the batter. Spoon in the rest of the batter and smooth the top. Place the springform in a pan and fill with hot water that comes halfway up the sides. Bake for 50 minutes and then turn the oven off. Leave the door closed and the cheesecake in the turned off oven for 1 hour. Remove from water bath and allow to come to room temperature. Stir in chocolate and butter until it is melted and creamy. Garnish with reserved cookies and serve.